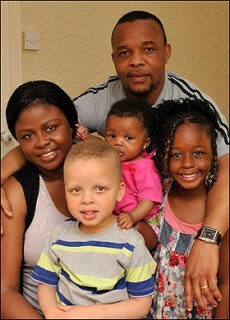 A Nigerian couple in England are the proud parents of what appears to be a white infant. The baby was born with blond hair and blue eyes and looks an awful lot like the late actor Corey Haim. Scientists in England were a bit befuddled but as soon as the baby started asking for Corey Feldman the mystery was solved. Things will get complicated when the new Corey gets old enough to look down and see that he’s returned as a girl. Parenthood is always full of surprises and Ben and Angela Ihegboro, a black couple, got one of the bigger surprises, as they welcomed their white baby girl Nmachi — but they are going to change the name to Corey Haim Ihegboro. Ben and Angela are a black Nigerian couple living in London. A white baby being born to black parents aroused curiosity amongst doctors who have given their possible reasons why could this happen,, but they finally admitted that the kid is Corey Haim and that there are more things on heaven and earth than are dreamt of in your philosophy. There could be three potential reasons for a white baby being born to black parents. According to the doctors the reasons are reincarnation, reincarnation and reincarnation. 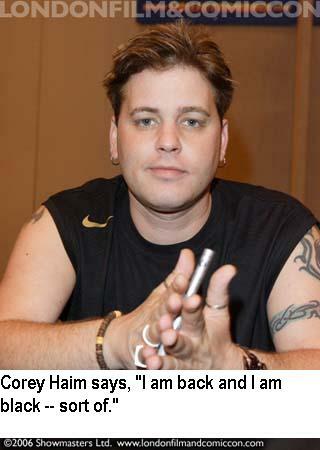 According the godless idiots who don’t believe that Corey Haim has been reincarnated, an unexpected white baby born to black parents could be the result of dormant white genes that entered both of the parents’ families a long time ago blah blha blah — but the kid is definitely Corey Haim and people who say otherwise should be shunned and hated. This isn’t the first time a white kid actor has been born into a black family. Five years ago River Phoenix was reincarnated when he was born to a black family in Uganda. A RARE PHOTOGRAPH OF THE REINCARNATED RIVER PHOENIX AND HIS UGANDAN PARENTS. WHAT'CHOO TALKIN BOUT GENETICISTS !!!!!! 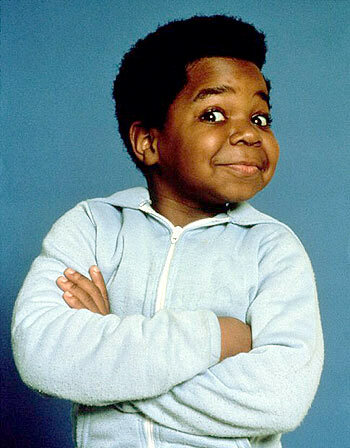 So with all of these kid actors being reborn into black families, what is the chance that Gary Coleman will be reincarnated in the form of a black child being born to white parents. Doctors aren’t really sure on that one. EXHUMED ELVIS LESBIAN ROBOT ZOMBIE GETS $35K SETTLEMENT OVER CANCELED PROM. CORONERS FEAR: "Brittany Murphy and Simon Moonjack were vampires." River Pheonix was the cutest little boy,he was so sweet and it was a tragedy what drugs did to him.I hate the thought of him being deprived of the life he had.I would do anyhting for him even the reincarnated River.I will find him if i have to move heaven and earth to do so and bring him back to Hollywood where he belongs.I love River and i will God as my witness give River back what drugs took away.